If you are looking for the best riding lawn mower you may have to dig deeper into your pocket as most of the really good mowers cost a whopping $ 5,000 and above. However, for the regular homeowner, a decent lawn mower that’s equal to the task doesn’t have to be a high-end pricewise. With a modest investment, you can still end-up with the best riding lawn mower for the money, one that will meet your specific needs. Lawn size and Terrain – if the size of your lawn is ¾ of an acre and above, quite honestly it’s a riding lawn mower or tractor you will need rather than a walk behind. Beyond this, you will need to choose between a rear engine lawn mower, lawn tractor, or a ZTR. Rear engine mowers will mostly fall within the lower price range because of their simplicity in design and their exclusive grass-cutting functionalities. The lawn tractors and the ZTRs are a bit pricey yet they are either multifunctional or more effective. The ZTR will reduce mowing time significantly while the lawn tractor can be used in some occasions as a garden tractor or tower. Again, rear engines will be great if you have an even terrain with few obstacles otherwise lawn tractors would be the better option if your terrain is sloped. Deck construction and size – cutting decks vary with size and function but you will need to consider your terrain in order to select the right size. For instance, if you have a large bare lawn with nothing going in terms of obstacles, a wider cutting deck of probably 42 inches and above will do your lawn some justice. You will work faster and more efficiently. On the other hand, if you have the same size of the lawn but loaded with obstacles, you may consider a smaller deck that will make it easier for you to maneuver around obstacles. A solidly constructed deck, mostly steel is usually the best if you are looking for a durable unit. Turning radius if you have opted for the non-ZTRs – If you have opted for the other ride-ons rather than the ZTRs then it is important to check the turning radius. The turning radius you will select depends on whether your terrain has obstacles or not. A shorter turning radius is much easier to maneuver and works well around obstacles and tight spots. Versatility vs speciality – if you really do not need all the functions in a versatile ride-on, say bagging, side discharge, and mulching, it could cost you less getting a high performing bagger only mower rather than a 3-in-1 that will fall below your expectation in terms of performance. On the other hand, it may be cheaper getting a versatile unit if you are a multitasker. It is better to opt for branded units with branded engines are usually better because their service centers and spare parts are readily available. Try and strike a balance between horsepower and the deck otherwise, you may end up with more horsepower with lower than expected performance. Performance wraps up several factors including horsepower, deck size, transmission type, and the drive system among other factors. Our review focuses on some of the best riding lawn mowers you may want to consider purchasing for what they are worth. We divided them into under $2000 and over $2000 ride-ons pegged on their prices. Troy-Bilt Riding has 30-Inch single cutting blade that enables it to maneuver lawns easily. Rated at under $ 2000, the neighborhood lawn mower performs exceptionally well for the residential user. It combines the benefits of a standard lawn mower and a wide-cut walk behind. It is compact in size and lightweight so storage should not be a problem as it will fit quite well in your garage. The mower 382 cc Powermore auto choke OHV engine with a 1.3 gallon fuel tank capacity makes a great option if you have an averagely sized landscape with an even terrain. A full tank of fuel can actually take you a full acre of mowing without running out. Otherwise, you will need to use the sight window on your fuel tank to check gas levels and refill when necessary. The engine powers the mower to achieve a maximum speed 4.25mph speed which you can easily adjust to 6-speed settings as you work thanks to the on-the-go transmission mechanism. Another important feature in the neighborhood lawn mower is its ability to mow in the reverse but a slower speed. In addition, its 18-inch radius is a plus during maneuvering. Along with its manual take off, you should be able to engage the blade much faster and more efficiently. again, larger 16-inch rear wheels offer enhanced traction which is an important feature when mowing on a slope. 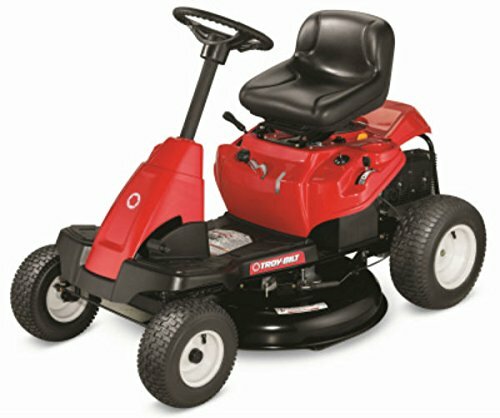 Comfort and convenience features in this mower include an adjustable high-back seat and a 13-inch soft grip steering. This is a top performing lawn mower suitable for those seeking to cut grass in their small and medium sized lawns. The residentially oriented zero turn mower by Ariens weighs just 425 pounds qualifying it as a lightweight. What makes it a powerhouse is the fact that it utilizes 19hp/660cc Kohler 6600V-twin engine. Twin cylinder-engines are generally powerful and are mostly used on heavy duty or frequently used mowers. In addition, it is an OHV which has the advantage of cooling and cleaning efficiently the engine, making it one of the best riding lawn mower for the money. In addition, it is designed with Smart-Choke™ technology that makes it is easy and reliable to start. Ariens Zoom 34 mower costs more than $2000 but this may be considered a good trade given that it provides the much-needed power and performance especially if you have a large yard of over two acres to mow. Besides, the Ariens Zoom is also integrated with Hydro-Gear ® EZT Full Transmission that ensures the rider operates effortlessly without the need to shift so much. You will certainly find the large hydraulic reservoir and cooling fans beneficial for a smooth transmission. Its 34” stamped deck made of strong 12-gauge steel first is tough and durable and second, will maneuver around your terrain features quite well. Finally, the Ariens Zoom 34 mower comes with a foot operated deck lift frees your hands to let your foot adjust the deck cutting height. A high back seat is a comfort feature that cannot be overlooked particularly if you will be mowing for long hours. The Hydro-Gear EZT transmission is recommended as the best and most convenient transmission for riding mowers. The Poulan PRO P54ZX ZTR mower is a great option if you are considering large-scale mowing. It provides a combination of quick performance, durability, and comfort. With a 24 HP Briggs & Stratton v-twin engine, it is rated commercial grade and can tackle hilly terrain or rugged yards with tough grass or stumps quite well. The mower utilizes a 54″ Reinforced Cutting Deck that is sure to deliver a clean cut even in hidden corners. The cutting deck gives you the option of cutting your grass at 6 preset heights between 1.5 inches and 4 inches. Poulan Pro P54ZX mower is designed with dual wheels Hydro gear EZT transmission allowing the operator smooth maneuverability even in the most featured terrain. Its ability to control its wheels independently makes it easy to move in all directions. This unit has a large capacity fuel tank at 3.5 gallons for long uninterrupted mowing sessions. 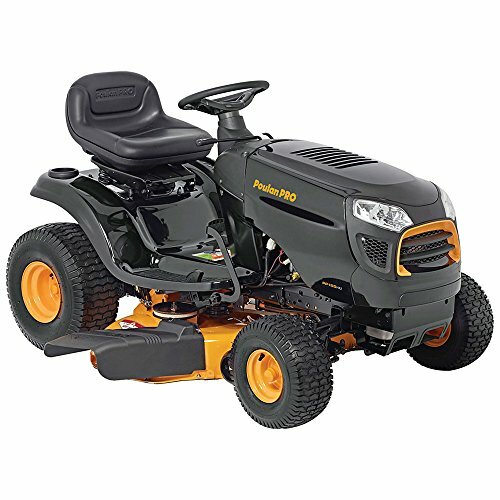 With added comfort features like the 15-inch high-back comfortable seat with padded foam grips you will take care of the stiffness and fatigue often felt during longer mowing sessions. 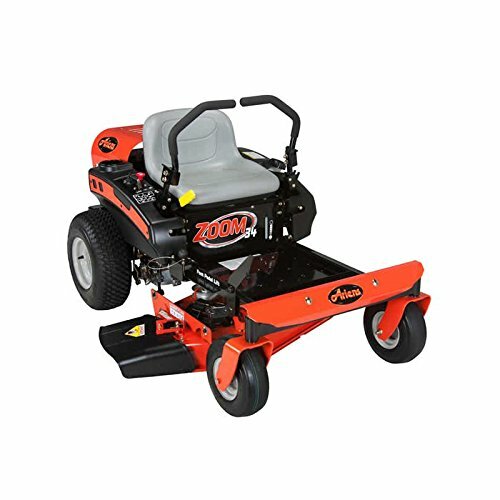 Aside from its steel construction, durability in this Poulan Pro ZTR is further enhanced by the fact that you can comfortably mow 2.9 acres in just an hour at 6mph, drastically reducing the time you could have spent mowing using other mowers and in turn, also reduce the wear and tear that could have taken place as a result. Husqvarna lawnmower’ is one of the easiest to control and also precise in its height adjustments thanks to its spring assisted deck lift system. This deck is powered by a 21.5 hp/ 724cc Briggs & Stratton Endurance engine with an auto choke feature that is not only powerful but also quite silent when in operation. This engine comes with an exceptional air filtration system, an electric start for ease of starting the mower chrome plate valves, and a cooling fan for optimal performance. Its 54-in 13-gauge stamped steel cutting deck is reinforced with durable heavy steel making it ideal for neat trims on the larger scale. 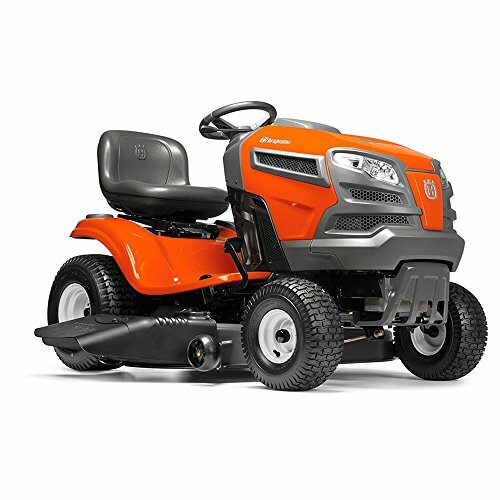 In addition, Husqvarna z246 makes use of the Air Induction Mowing Technology designed to draw air from both the bottom and the top of the deck, which effectively lifts the grass and a tri-cut thanks to its three cutting blades, to deliver a fine cut. The deck is adjustable to 6 preset cutting height positions within a range of 1.5 and 4 inches. The Hydro-gear Transmission system is known for its smooth operation and easy speed adjustment up to a maximum impressive forward speed of 6.5mph. Other comforts and convenience features incorporated in this unit include a digital hour meter, a front guard bumper to protect the front of the mower, an electric blade engagement system, and a 15-inch comfortable seat. We pit these mowers against each other and the Poulan Pro P54ZX ZTR mower emerged top of the best as the best riding lawn mower for the money. It comes with remarkable performance features like a powerful engine, wide 54-inch solidly constructed cutting deck with great maneuverability. It tackles larger lawns quite well and comes with great comfort features. This unit we felt is definitely a worthwhile purchase for the frequent user or the mowing entrepreneur.